Perfect for any type of rehabilitation and incredibly affordable. 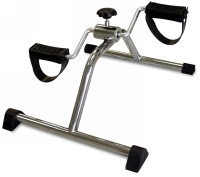 At only 5 lbs., the Chattanooga Group Resistive Pedal Exerciser is extremely lightweight, with a sleek chrome finish and wrap around foot straps. Comes completely assembled with retail or standard packaging.